This Firestar is designed and handmade by Frank Deimel, world-class luthier from Germany. It is custom made and building time is apx. 12 months. This Firestar in color »Venus Fern Green« features the classic Tune-O-Matic/Stoptail bridge custom made by ABM, Berlin. Pickups are an Amber Spirit of 59 bridge, and our special Deimel Sweet90 single coils, which suit so much better to a HB, than any rod magnet Single coils. The circuit is customized towards 3 pickups. Therefore the switch section from left to right out of the playing position is the following: piezo (on/off), middle PU (on/off), split bridge HB! Being a very versatile circuit with 10! regular sounds, plus additional piezo on all of them, makes up to up to 20 different sounds! 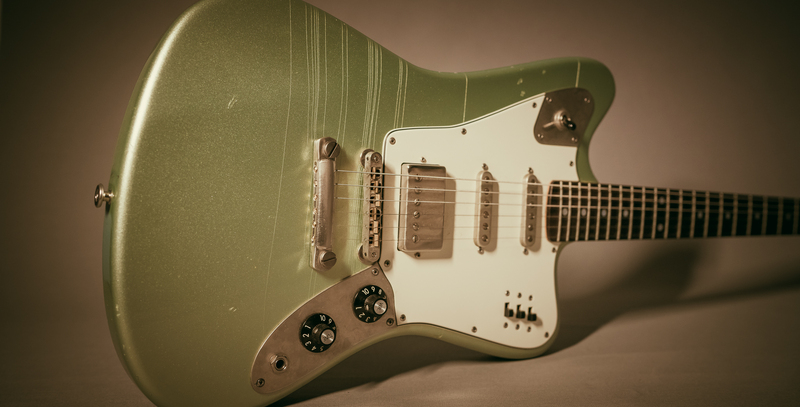 The entire hardware on this one is slightly aged, the body is finished in our »Venus Fern Green« metallic, with a nicely cracked pattern in the nitro top coats! This guitar is custom made for you. Building time is currently 12 months. Interested in trying out this Firestar? Contact us for an appointment.